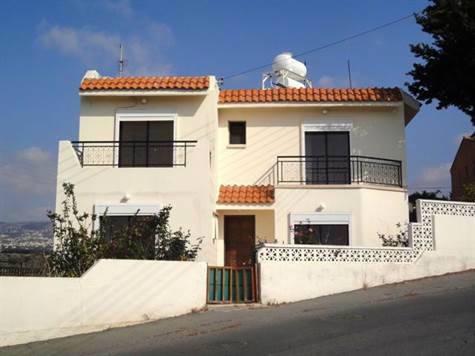 Cyprus Property Blog by Cleo : Back on the Market - Chloraka Detached Villa - Bargain! Chloraka Village, Paphos - This spacious 4 bedroom detached villa is located in the popular area of Chloraka, within easy walking distance to the beach, local shops & restaurants, and the local bus route running between Paphos and Coral Bay. The property features spacious living accommodation including lounge with open hearth fireplace, formal dining area and fitted kitchen with breakfast bar. Off the lounge is a balcony with gorgeous sea and mountain views. A guest cloakroom is situated at the base of the central staircase which leads up to the first floor and down to the basement. Upstairs are three double bedrooms, all with fitted wardrobes and there is a family size bathroom accessed directly from the landing. Two bedrooms have their own balcony with stunning sea and mountain views and a third balcony off the landing also enjoys a wonderful coastal and rural aspect. In the basement is a large 4th bedroom with seating area and en-suite shower room, a separate kitchen and large garage. There is scope to easily convert this level to self contained accommodation with direct external access. Outside, is a paved terrace to the front and one side of the property. To the other side is a long driveway leading to the garage and rear terrace. The property has huge potential and with some renovation is ideal as a holiday home or permanent residence.